I’ve been having fun the last couple days experimenting with different flavors. Yesterday I was in the mood for some Italian. Pesto SooFoo anyone? Deliziosissima! And I felt a lot better about myself after eating a plate of this as opposed to all the wasted carbs in a big plate of pasta. I’ll probably have to do this for lunch again sometime soon! For a romantic dinner with my girl last night, I heated up some SooFoo with beef soup stock, and served as a side to grilled surf n’ turf. Not bad, although the steak could have been cooked a little more for my liking. I forgot to take a photo of my non-masterful steak cooking. It was back to SooFoo cereal this morning. 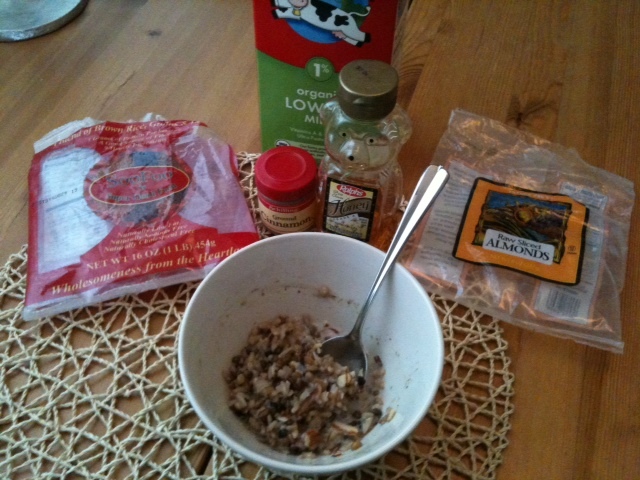 I tried it according to Maurice Kanbar’s suggested recipe on the back of the package, with cinnamon, honey, and milk. 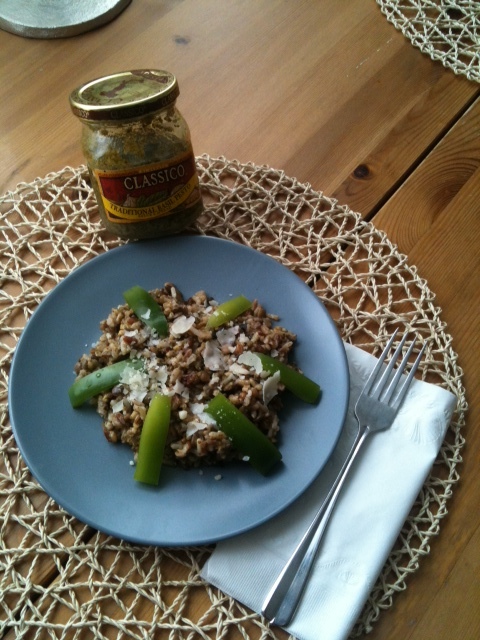 Very good, I even added in some shaved almonds for some added variety (in case 9 healthy grains isn’t variety enough.) It’s like eating oatmeal with a little more texture and heartiness. It’s just about retraining the American brain that there’s nothing wrong with eating lentils and brown rice for breakfast. If it’s healthy and tasty, why not?!? 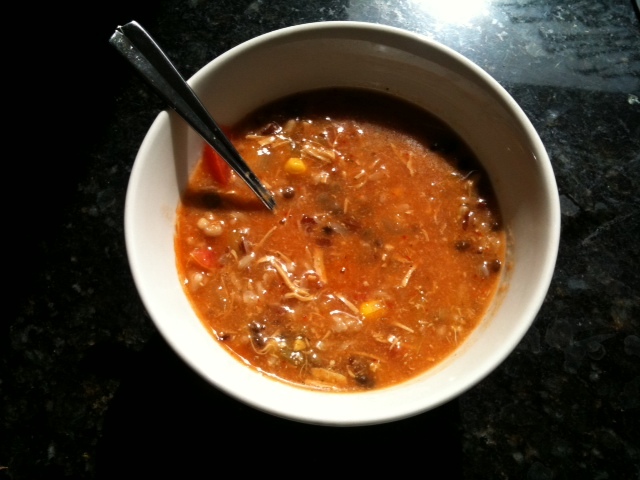 Later this morning I used SooFoo as a mixer for store prepared tortilla soup for lunch. Soups are just a natural fit for SooFoo. I expected it to be excellent and it was. Just a little bit of sunshine on one of those rare gloomy days in California. So I’m mid-way through Day 5 of the Challenge and I haven’t noticed feeling any different. That’s both good and bad I suppose and I’ll definitely give it a little more time. Thanks for all the recipe recommendations. I’ll be trying some soon and please keep them coming. Now, what to make for dinner?